Think you have a story idea? Develop a premise. The premise is your hypothesis. It is a statement based on a guess. A good premise is based on some fact you discovered or observation you made, or conclusion you came to after reading a news story or hearing some complaints from people. It isn’t information you can base a story on. But is information that helps you formulate a guess. A premise is a statement. The administration is putting student safety at risk by prioritizing other financial needs over needed repairs. The university is balancing its budget without tuition increases by pushing off expenses onto students through increased student fees. The premise needs to be something that can be proven or disproven. A well-crafted premise will help you focus your investigation. Keep in mind, though, that as you gather information from human sources and documents, you will likely change your premise. In a long, complicated investigation, the premise you end with might be very different from the premise you started with. Crafting a compelling long form story is difficult. Your goal is to compel readers into your story and keep them there until the last word. But in an attention deficit world that’s difficult. You don’t just need a compelling lead. You need compelling leads throughout your story. Think about your story as if it were a book. Ever try reading a long book without chapters? Yikes! Divid e your story up into “chapters” or mini-stories. Each mini-story will need its own compelling lead. You might think about these mini stories as inverted pyramids. The problem is that the end of each mini story gives readers an exit door out of the story. That’s where the Martini Glass style of story writing comes in. It is an inverted pyramid with a nice, juicy quote or piece of information as your glass stem or kicker. So what you end up with is a string of martini glasses standing on top of each other. Right after the juicy ending quote of one section comes a compelling secondary lead drawing the reader back into the story. 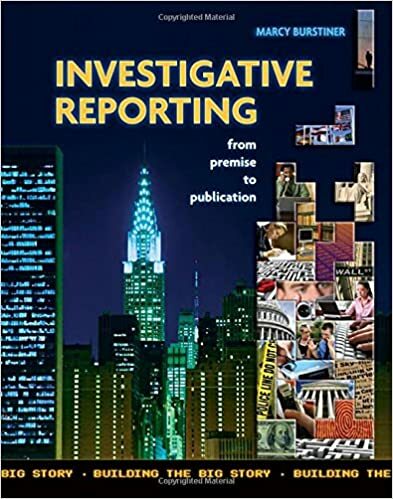 Summer is a great time to practice some investigative reporting skills. Over the next few weeks, I’ll lay out a series of tasks you can do so that when you return to school in the fall, you’ll be all set to form your I-Team and get going. daily. Find a story about some kind of problem. It might be a breaking news story. It might be a comment from someone in a write up of a city council meeting. Create a chart. In one column write a list of questions you have from what you read that the reporter failed to ask. In the other column come up with one person or place that might have the answer to that question. To give yourself bonus points, shoot out a public records request for information about that problem.